Put this date in your calendar folks! 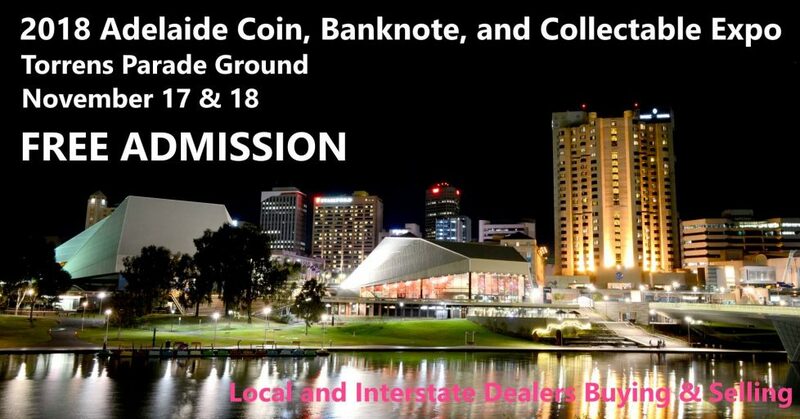 The Adelaide Coin, Banknote, Stamp and Collectable Expo is on again in the heart of the city. The venue is the Torrens Parade Ground Hall, corner Victoria Drive & King William Rd, Adelaide City (opposite Adelaide Oval). Buying and Selling Coins, Banknotes, Medals, Tokens, Gold, Silver, Stamps, Militaria, Ephemera, Collectables and much more. Free entry, Free parking, Free valuations. An auction will be held on Saturday afternoon. Raffle and prizes. Numismatic displays. Refreshments available. Easy level access, wheelchair and assistance dog friendly.